Articles How thin can a board be? Eight millimetre. 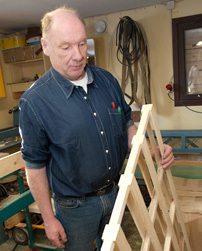 The answer comes from frame saw-owner Stig Johansson. 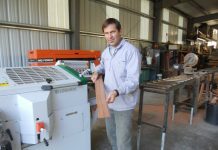 He has succeeded with something that few others manage on a large scale, sawing just eight millimetres in thickness in order to produce ‘spacers’. These are used to stack several levels of goods on Euro pallet. 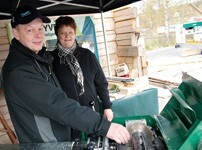 Stig Johansson has sawing and woodworking in his genes. However, he became a forklift truck repair mechanic by profession. Initially as an employee at the then Asea Truck, and subsequently on a self-employed basis. 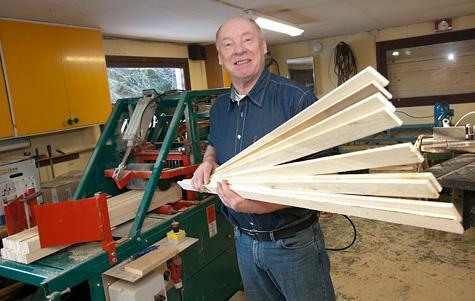 “When I went self-employed, I had the chance to devote myself to wood,” says Stig. Stig’s job as a forklift truck repair mechanic led to him and his family moving to the town of Nybro, which was ideally suited for a roving life as a service fitter in southeast Sweden. His wife’s great interest is horses, so the couple settled down on a farm outside the town. The garage has been converted into a joinery works which, in addition to the previously water-powered machines, now also houses a Logosol-Laks 330 frame saw and a PH260 four-sided planer. 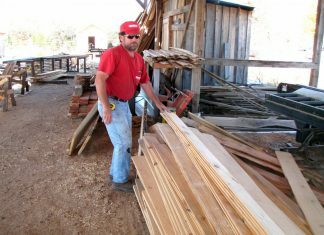 “The frame saw is a fantastic machine. 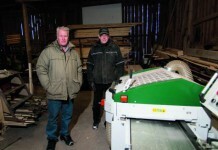 At first I felt that it went slowly, but it is just right, as I have time both to look after the timber in the machine and to feed in new timber,” says Stig. 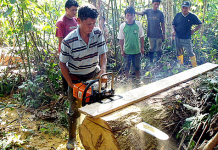 The frame saw has been used professionally to manufacture raw materials for packaging. Stig has succeeded with something that few others manage on a large scale, sawing just eight millimetres in thickness in order to produce ‘spacers’. These are used to stack several levels of goods on Euro pallets, allowing air to circulate between the various levels. The production of packaging materials has taken up all his time, alongside his forklift truck servicing work. 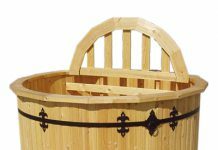 As a result, fine woodworking has had to take a back seat. Stig has had the PH260 for ten years without using it all that much, but now as he approaches retirement he is getting ready to concentrate on fine woodworking full time. 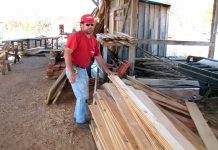 “The combination of the frame saw and the four-sided planer is perfect. 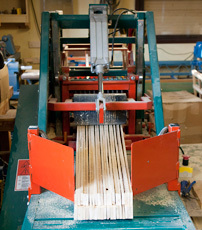 The dimensions after sawing are excellent, making it easier to plane with good results,” says Stig. He expects to develop the planing of special profiles for customers in his local area, and intends to set aside more time for his own projects. A major renovation of his home is first on the agenda, and that will entail a great deal of planing, which will please the family’s horses. “The horses much prefer planer shavings to sawdust,” says Stig.